The Chicago Transit Authority (CTA) is the nation's second largest public transportation system operating throughout the City of Chicago and 40 surrounding suburbs. Daily weekday ridership averages 1.6 million passengers who rely upon the CTA for access to work or Chicago’s numerous attractions and venues. With connecting services to both Metra and Pace, the CTA, a part of the regional transit system, accounts for 83% of all public transit trips in Cook, Lake, Dupage, McHenry, Kane and Will counties. The CTA currently operates 1,781 buses over 140 routes and 1,959 route miles. There are 11,493 posted bus stops and CTA buses make roughly 19,709 trips daily. 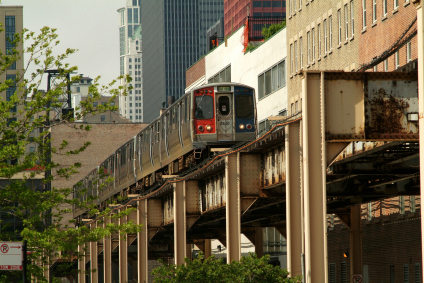 CTA trains serve 143 stations and make approximately 2,145 trips each daily. This rapid transit system includes eight routes using 1,200 rail cars covering 224.1 miles of track. The convenience is truly amazing and includes access to both of Chicago’s international airports. Travelers can ride the CTA Blue Line ‘L’ to and from O’Hare International Airport or alternately board the Orange Line trains, which operate clockwise on the Loop ‘L’ structure, for access to and from Midway Airport. Even off-hours riders have options on certain routes for CTA’s around-the-clock service. Late at night and early in the morning, major rail lines and some of CTA’s bus routes offer a “Night Owl” service, much of it with connecting schedules and routing. For additional CTA information, schedules, train station/stop locations, maps and more, click here to visit the official website.